Here you are, feeling like an absolute princess. The man of your dreams has popped the question to you and you of course said “YES!” You’ve talked options and made the amazing choice to pack your bags and head for sun and sand to say your “I do’s”, you may even have your resort and destination picked out which is a huge step in the right direction. Now that the hard part of making those decisions are over, you may be asking yourself what could possibly be next. Not to worry, we assure you that planning a destination wedding can be fun every single step of the way. At Weddings by Funjet, we know that destination weddings are unfamiliar to many couples, and that’s where we come in. We’re the well-traveled friend with the well-worn passport here to make planning a destination wedding fun, stress free, and unique to you as a couple! Now that it’s time to dive into the wedding planning, the first choice you will make after selecting the date will be to decide what type of wedding ceremony is best for you. The two main choices are “symbolic” or “legal/civil”. The requirements and details vary by destination and even by resort, so let us help break this down for you based on what experience you are looking for. 1. You want your destination wedding to be a cultural experience. We know that often times couples decide on a destination wedding to do something more unique and to have the ability to put their own spin on things. If you’re looking to have a totally authentic cultural experience tied into your wedding, a Legal ceremony may be best. In Mexico and the Dominican Republic, legal wedding ceremonies are generally performed in Spanish by the Justice of the Peace, and then are translated simultaneously by the resort’s professional onsite wedding coordinator. Concierge Insider Tip: Take the cultural experience one step further by having a mariachi band in Mexico, or reggae band in Jamaica, perform during cocktail hour to keep the destination vibes as authentic as can be. 2. You want to have to do as little as possible once you arrive in destination. For a symbolic ceremony, there is little that needs to be done upon arriving in destination. In comparison, a legal/civil ceremony can require a few extra steps once you arrive. For example, in Mexico in order to have a legal ceremony performed it is required that both the bride and groom have a blood test done. The government does blood testing to check for blood type, HIV, and STI’s. The good news is that the blood test is done right onsite at the resort by a medical professional. 3. You want to have a friend or family member perform the ceremony. Symbolic ceremonies offer a little more flexibility due to the nature of not being a government officiated marriage. If you’re looking to have Uncle Joe marry you and your future spouse, we suggest looking into the symbolic ceremony. Legal ceremonies absolutely must be performed by a representative of the state or country that you are in at the time of marriage. With a symbolic ceremony, the wedding is not seen as legally binding by the country in which you are in, so anyone is able to perform the ceremony. 4. You want the wedding date to be the only wedding date. 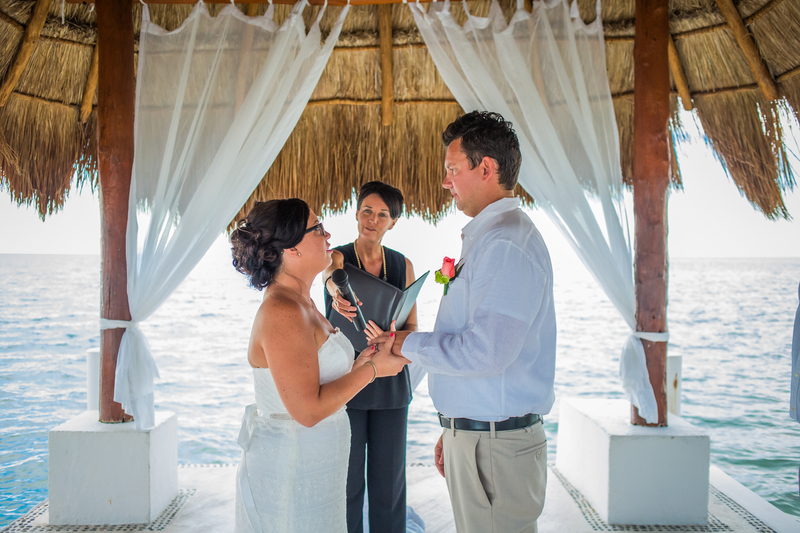 Legal ceremonies offer the ability to have everything legal taken care of all at once in destination. It’s important to note that a legal ceremony will require you to gather legal documents in advance such as your passport, birth certificate, and copy of divorce decree (if applicable), and send them to the resort at least 3 months in advance. We suggest making sure that you have the requirements from your specific resort to follow their policies carefully. The paperwork will be processed to have the wedding officially recognized within the destination, but it is the responsibility of the newlyweds to follow up with their local courthouse on processing any documents in order to obtain a wedding certificate for their homeland. Already hitched or looking to have the courthouse ceremony before? If this is the case, we then suggest looking into a symbolic ceremony since the legal stuff will already be taken care of. 5. You want to be able to customize your wedding ceremony to add a few “quirky and unique” parts that represent your love. Although legal wedding ceremonies allow you to write your own vows, we know that you may want to put a more creative spin on things. A symbolic ceremony will not have to adhere to government laws and gives you the ability to incorporate elements that are distinctly you as a couple. A symbolic ceremony is best for couples that want to have a knot tying ceremony, sand ceremony, or to take a selfie at the altar. Concierge Insider Tip: Do you have an intimate wedding celebration in mind? Looking for DJ alternatives at your dinner and reception? We suggest using the audio equipment at your ceremony to your advantage if you still want to have your first dance together. A perfect time to have that first dance moment would be right after the ring exchange! 6. You’re looking for the absolute best excuse to be in destination as soon as possible. In all destinations, it’s a general requirement by both the government and the resort for the couple (and their witnesses) to arrive in destination three to four business days before the ceremony date if a legal ceremony will be performed. Symbolic ceremonies generally require two to three days before the wedding. As always, we suggest getting the official requirements for your specific destination from your Weddings by Funjet concierge. A legal ceremony can simply be the best way to get the party started as soon as possible! In the end, we suggest speaking with a Weddings by Funjet concierge to learn more about the specifics of each resort and destination. Countries and resorts vary by their requirements for both symbolic and legal ceremonies, so we think it’s best to lay out all of your options before making a final decision. We know that this is the first time many couples are getting married in another country, none the less their first time getting married at all! We’re here to help and make the process as easy as can be. Have a specific destination in mind and want to learn more about marriage requirements and the differences between ceremonies? Contact a wedding concierge today! Myself and my wife are going on honeymoon in Mexico from the 8th of December this year. We would like to have a symbolic wedding ceremony. We are already legally married but would like to have a ceremony again. Very simple.. We would have no guests and basically it would just be the two of us. Could you please give me some advice on how to do this? Hi Ben! Thank you for your comments and inquiry. We would like to learn more about the details of your honeymoon in order to assist you further, or put you in the right direction to plan a ceremony for just the two of you. Our intake specialist will follow up with you via email shortly! Have a wonderful day. I have been with my better half going on 12 years. We are both US citiz, and not married. We would love to have a symbolic wedding. My question is, would we be able to still have a pastor at a symbolic wedding if we do not plan to legalize our marriage in the U.S or Mexico?? Or would it have to be someone we choose such as a friend or family member? Thank you for reaching out to us, and congratulations on being with your better half for 12 years! Assuming you would like to host a symbolic ceremony in Mexico, most hotels will require you to legally marry in your home country and send the proof of marriage to them prior to arrival. Weddings by Funjet concierges can guide you through this process, and help you each step of the way. Options in bringing your own pastor to conduct the ceremony varies by hotel, but this is typically not a problem at all. Would you like me to have a Concierge reach out to you with more details? My son and his fiancé want to do a symbolic ceremony in Cancun Mexico but the resort we are staying in has no options available. Any suggestions on where we could do this type of ceremony that would make an amazing memory. There will be approximately 20 people with us. Hi Karen! Thank you for reaching out to Weddings by Funjet. We would love to find out more details in order to best assist you, one of our team members will be in touch with you shortly. Thank you! My partner and I have been together for sometime but his divorce from his ex (which has been going on even longer) has not yet been finalized. Due to travel-timing restrictions (for my profession), we are left with only being able to get married this summer or next. We would like to do it this summer (as our parents are getting older) but his divorce may not be fully finalized. Are we able to have a strictly symbolic ceremony only (with plans of having a civic ceremony back home when it is)? Thank you for reaching out to Weddings by Funjet. We recommend waiting until his divorce is finalized to avoid running into any issues. Most hotels in Mexico and the Caribbean do require proof of a civil ceremony stateside in order to perform a symbolic ceremony in destination. Please don’t hesitate to reach out to us if you have any further questions, or when you are ready to plan! Myself and my husband are planning to go on honeymoon to Mexico (Riviera Maya ) from 16th of November 2019 . We would like to have a symbolic wedding ceremony on the beach. We are already legally married but would like to have a ceremony to say vows again and to take some pictures. We would have no guests , just two of us and our 4yo son. We have already chosen the hotel (Xcaret hotel ) but we don’t like their wedding packages ,so looking for something privately. Thank you for reaching out to Weddings by Funjet! One of our Wedding Concierges would be happy to assist you with planning a symbolic beach ceremony. Please feel free to fill out an inquiry form at https://weddingsbyfunjet.com/contact-weddings-by-funjet-concierge/ and one of our Wedding Concierges will contact you to help get your planning started!